I used a $50 certificate at Aureole a few months ago, no problem ! No, you can't 'stack' them (unfortunately). Heading to Lost Wages the middle of the week. Already have reservations at Joel Robuchon at the Mansion and Alex. Yippee !!!!!!! Robuchon was OK. NOTHING made me go wow. Desserts were a big disappointment bordering on yucky. Speaking of the wait staff, professional, courteous and helpful. We order what we like, if we can sit in a restaurant we better be able to order at lest 95% of the menu without worrying, however we don't drink wine or cocktails and don't like to fill up with carbonated beverages, ergo no big drink bills and some places let you know they disapprove of that. NOT HERE. Totally one of the best meals I can remember eating. What is "stack them" ? I think she means you cannot use more than one coupon per visit. Ideally it would be all organic. I'll be staying @ caesar's palace, does this sound accomplishable at all? I heard the Canyon Ranch Cafe has some pretty good organic eggs so I can have that, but I have to find a way to make sure there's no butter or cream. Other than that I planned a dinner at swish shabu shabu. Would any of the buffet's accomodate me? Are there any good seafood restaurants where i can just get some broiled fish and steamed vegetables? Last Thursday, I was in Las Vegas for the 2010 Epicurean Affair. (You can read my report here). I made it a long weekend and one of the restaurants I visited while I was in town was Tableau at the Wynn for lunch on Friday afternoon. Finding a fine-dining restaurant open for lunch on the Strip has always been a challenge in Las Vegas and the continuing woes of the local economy has only added to that problem. Rooms that were once open at noon are now dark. One is hard-pressed to win a bet on the ultimate trifecta-lunch, high-quality cooking and a quiet respite from the throngs of tourists, gamblers and conventioneers to find a decent mid-day meal. After lunch at Tableau with a friend who lives in Las Vegas, I would venture to say we won the bet. Tableau is located in the Tower Suites and one enters through a separate entrance from the main hotel and casino. The main restaurant is set in a round atrium with floor to ceiling glass windows looking out toward the garden and pool areas with outdoor seating on the patio. Chef David Spero’s focus is on preparing American cuisine using fresh, seasonal ingredients. Mr. Wynn recently changed his dietary persuasion to Vegan and as a result, Tableau offers a separate Vegan menu. I must say I was surprised, but impressed, to presented with a separate Vegan menu at lunch as if it were a wine list. (Quite surprised given my carnivorous appetite). Some diners would probably turn their noses at the thought of a Vegan menu. In most cases, a vegan dish is listed in passing at the bottom of the menu and the word "wheatgrass" scares most diners from ordering. But at Tableau, the concept is presented with options in the appetizer, entrée and dessert courses and is sure to be popular with today’s tastes. The Vegan items included a Chop Salad, Creamy Corn Soup, Napoleon of Savory Tofu, Ratatouille of Eggplant and Chocolate Cake. 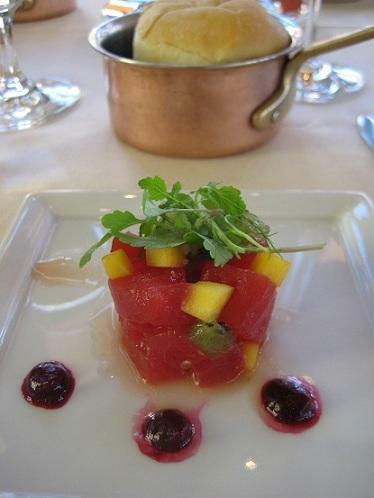 We started with one of the Vegan starters, (designed by Chef Spero to be a play on “Tuna Tartare”). 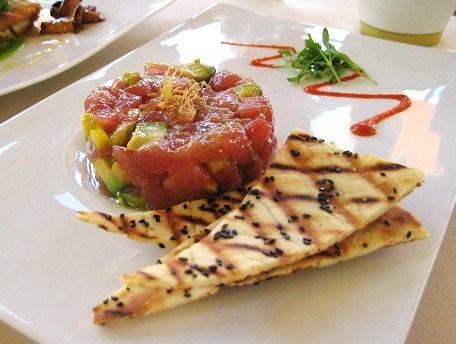 For lunch, we shared three dishes, starting with the un-Vegan "tartare." The next dish was new to the menu within the past two weeks. 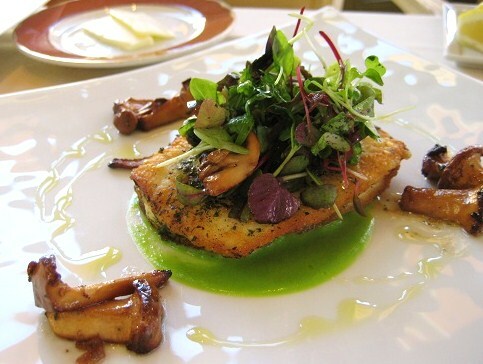 It was fresh and simple, composed of three main ingredients-Turbot, chanterelles and fresh peas, yet it was full of vibrant summer flavors and contrasting textures. Chef Spero poached the turbot in olive oil, and then appeared to have lightly crusted the fish with breadcrumbs and run it quickly under a salamander. 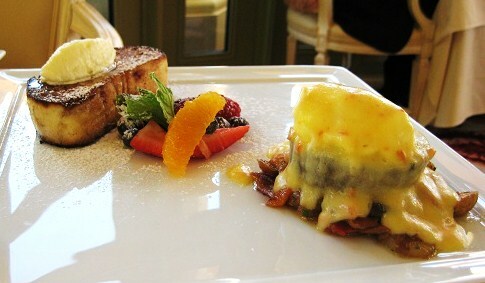 While we were waiting for dessert, the kitchen sent out two of the popular dishes off their breakfast menu. 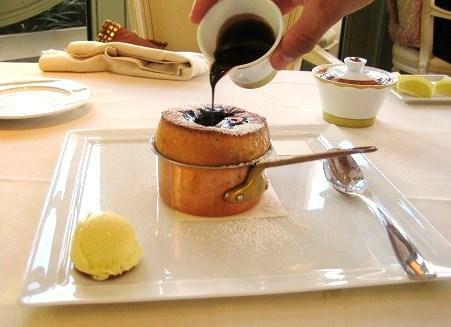 I don’t think I’ve actually ever seen a soufflé offered for dessert on a luncheon menu-at least not in my lifetime. 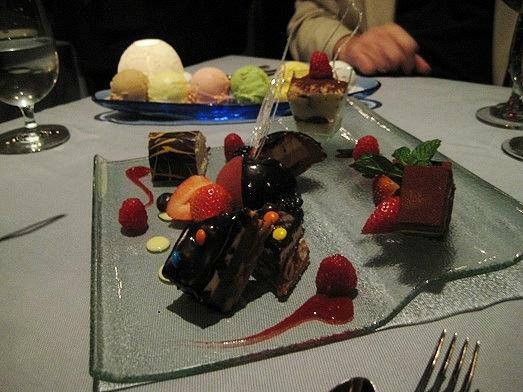 But I relied on the recommendation of my friend and we ordered the restaurant’s signature dessert. One final note. Given my professional background in customer service, I was impressed with the attention to detail and the personalized service we received from our waiter. One typically doesn’t find such gracious service in Las Vegas during the noon hour. If you are looking for a quiet oasis for lunch and fancy a glass of champagne with superior American cuisine, I would recommend Tableau at the Wynn. Tableau is a nice place. Been there for both breakfast and lunch. (it's no longer open for dinner. Another victim of the tough times in Las Vegas). Not only does Tableau have a vegan menu, ALL the restaurants in Wynn/Encore have one now. Pretty interesting. Yeah, they guy with his name on the building can get his way. But Steve could always get that without the need to have actual menus offered for all guests. Really, a nice touch from a class operation. I ate at Hash House a Go Go when I was in Vegas last December and it was amazing. We had the Fried chicken eggs benedict and a pancake as big as a wagon wheel. At the time we were there they were preparing to open a Hash House on the Strip in the Imperial Palace Casino. I also visited Hot and Spicy Crawfish located in a strip mall and no surprise adjacent to a Massage Parlor. We had some crawfish that were wonderfully spicy and some blue crabs as well. At the end I had used up too many paper towels to think about (the poor environment) and my lips were swollen from the spices. Both were a great experience! Hash House is up and running at the IP. It's been there for several months now. Also, they recently opened a location at the M Resort. Not really my kind of place, though. Typically, I get turned off by a place where the claim to fame is really gigantic portions. The wife and I ate at HH about a year ago. Food was very good and the portions were huge. We have had worse food at so called better restaurants. Delighted to read your review of Tableau. I've booked a return trip to LV for early April to stay at the Tower Suites at The Wynn. Your photos are wonderful, and I can't wait to try Tableau. We'll be at the tower suites at Encore Wynn in November. After staying at the Wynn when it first opened a few years ago, then back to the Wynn, then Encore when it opened, we wouldn't stay anywhere else. The one thing Steve Wynn does better than anyone else, is service. I am looking forward to hopefully trying Tableau this time around. We're only there three days this time and all of our meals are booked at the Wynn or at Encore. We too Marlene after reading David's review of Tableau , we made a reservation for lunch on a Saturday. FYI, we also have Cut. The 28 day dry aged steak is delicious. Best meal I had in Vegas was at Picasso. Service was incredible and food was as well. Cut was also a good dining experience if you like steakhouses. I REALLY want to eat at Twist though. I spent the weekend in Las Vegas a week ago. I had nice meals at Otto, the Batali restaurant in Venice. The standout was the pasta course. We went there twice and sampled the lamb ragu which was my favorite, and also a great carbonara, and a super rich pork belly ragu (as expected). We also had the cheese & meat boards. The affogato that we finished our meal with was excellent. Overall we felt that the menu was similar to Osteria Mozza in LA, but the execution & service were better at Mozza. Prices were reasonable for Vegas (about $20 for a pasta course). The best meal during our trip was at Sen of Japan, a sushi restaurant off the strip led by a former head chef from Nobu. The restaurant is located in a nondescript shopping mall; the décor is very simple and unremarkable. But everything else was not. The service was impeccable. We had the five course omakase and everything was outstanding. The most memorable courses for me were the yellowtail sashimi with jalapeño and crispy garlic, the black cod in miso, the inventive sushi rolls, and the miso soup with clams. We had similar dishes at Nobu before (the preparations for the yellowtail and the black cod were especially familiar), but I felt that the attention to detail was really excellent at Sen of Japan and service was much more engaged and genuinely interested in creating the best experience for us. It was also about half of the price too which does not hurt! The five-course omakase is priced at $55. I'm in Las Vegas for a week of dining. Last night we had dinner at Valentino in the Venetian. 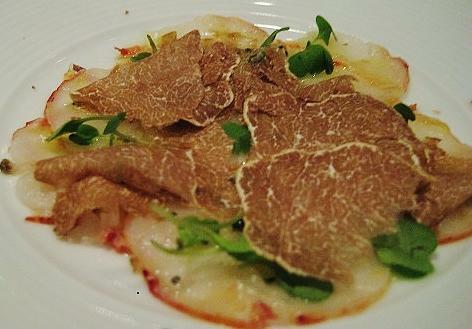 Chef Luciano Pellegrini indulged my request to create some dishes using the season's white truffles from Alba. 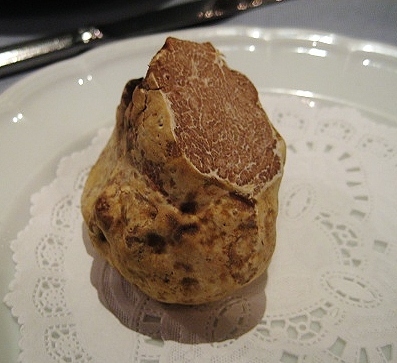 Chef Pellegrini said that the Alba truffles are at the height of their flavor right now. He's been getting 1 or 2 truffles in each week and expects to have them available into the first week of December. We also had the opportunity to have a conversation with Piero Selvaggio, (owner of Valentino restaurant group), who happened to be in town this week. As many of you know, Mr. Selvaggio has been responsible for bringing true, regional Italian cuisine to America for over 30 years. omg does that look sweet! how large was it? and please tell us more about the courses! It was about as big as your fist and in the neighborhood of $1,600, so you can imagine how many shavings, (and supplemental charges), they get out of one truffle. 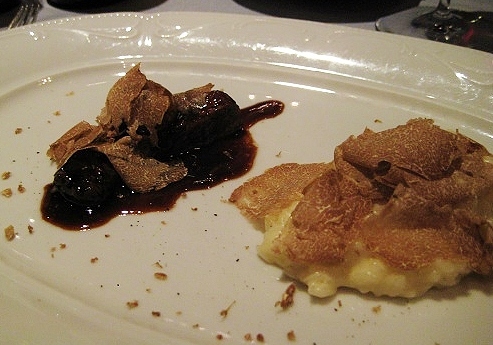 The Chef did a tasting menu that was primarily composed of dishes with white truffles. 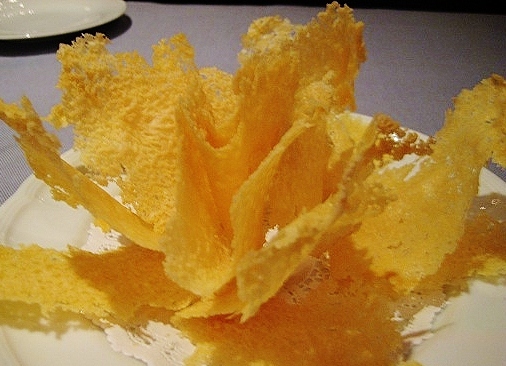 Once you are seated, the waitstaff bring a stunning dish of parmesan as you are looking over the menu. It’s simply parmesano-reggiano, shredded and fried until it melts, then formed into “petals.” The “petals” are married to create a “parmesan flower”-crispy, salty and tangy. The Lobster was dressed with a drizzle of extra virgin olive oil. While my friends felt the truffles over-powered the lobster, I disagreed. 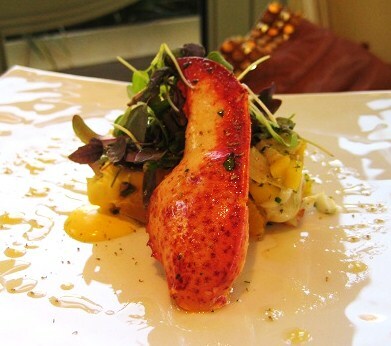 The truffles gave a heady scent and salty taste that accented the sweet flavor of the lobster meat. Chef Pelligrini is a master with game birds, treating them with the delicate respect they deserve in order to present meat that is tender and juicy. For the next course, he served a semi-boneless quail that was roasted then glazed with a Riesling sauce and presented on a sautéed parsnip cake—and shavings of white truffles. 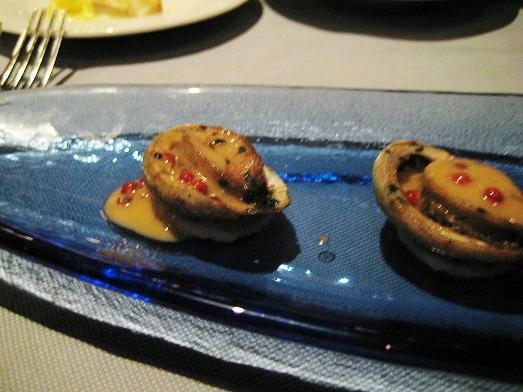 The next course was relieved of the shower of white truffles, yet it did not suffer--tiny nuggets of abalone served with a pink peppercorn cream sauce. Chef sources these “baby” abalone from Australia. We agreed that the pink peppercorn cream sauce was too peppery and rich for the sweetness of the abalone—a hint of lemon and olive oil would have been the only partner necessary. 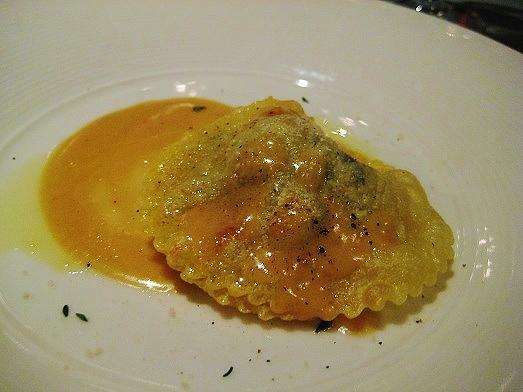 Ravioli of slow-cooked pork and escargot with a pumpkin-butter sauce. Your inclination is to turn away from such an unlikely pairing--pork and snails, yet the meat of the pig was meltingly tender and salty and offset by just a hint of the sea provided by the snails. The Gelato flavors included Chocolate, Vanilla, Strawberry, Pistachio, Mango and Lemon. While other Italian restaurants along the Strip often garnish more press due to the trendy nature of Vegas, (Rao’s and any Batali outpost among them), the quality and consistency of the Valentino kitchen and the gracious service of the staff should merit a visit next time you are in town. 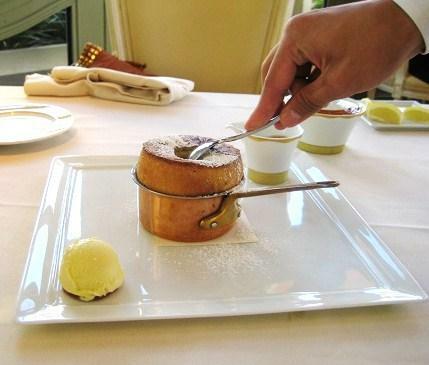 Is Guy Savoy's artichoke and black truffle soup as good as it sounds like it would be? I'm planning to go to Vegas next Feb and Savoy is at the top of my list of places to eat, along with Robuchon, Gagnaire and Ducasse's place. Is it unrealistic to think I could get into all of them? Hopefully this is long enough in advance to make reservations. That soup is divine! Tastes even better than it sounds! My husband doesn't like artichoke much and he loved it. He said he would eat artichoke regularly if it tastes like that! Guy Savoy is my personal favorite, even compare to Robuchon (we had the 16 course tasting menu) and French Laundry. The highlight of a recent meal at Per Se was the artichoke coronet. When the highlight is an amuse bouche, that's not such a good thing. I trust Guy Savoy to do something miraculous with this wonderful vegetable. Thank you for your observations. So The Cosmopolitan of Las Vegas opened up earlier this week. Interesting lineup of restaurants. A Greek place? That's a really interesting. A Chinese/Mexican fusion place? I suppose if anyone can make that work, it would be Jose Andres. They too are jumping on the burger craze that is sweeping the dining scene. But from what I've heard so far, it seem to be a contender. In any case, I wish the folks at Cosmo the best of luck. They are really gonna try hard, I think. Gonna try to do things maybe a little differently. Looking forward to checking things out in 2011. Also, it will be the LAST place to open out there for a LONG time. That means we won't see a big collection of restaurants pop up all at once for a LONG time. Sad to report that Alex at Wynn is closing next week. Such a terrible loss. I rarely if ever get upset when restaurants in Las Vegas close, even good joints that I really enjoyed. It's all a part of the gig of playing in Vegas. But...I was shocked and saddened when I heard from a friend in Las Vegas today that Alex is closing. That is a huge loss for the Wynn property and for the Las Vegas dining scene. It was the flagship restaurant of the Wynn empire. One can only hope that we will see the space with the grand staircase re-incarnated into something just as delicious as Alex--and we'll see Chef Alex Stratta continue to ply his craft in Las Vegas.